Nokya 9012 55W HIR replacement bulbs, there are 3 colors to choose from. Crystal Clear is 3100K similar to the OEM color, Arctic white is 7000K and Hyper yellow is 2500K. HIR (Halogen bulb with Infrared Reflective lamp) was originally designed/developed by GE. HIR bulb is designed to use filament to emit light as halogen bulb, which is coated with an infrared reflective film inside the glass capsule to reflect the energy produced by the filament back inside to re-heat the filament ... causing the bulb to glow much brighter than normal halogen bulb without increase more heat to the capsule itself. The advantage of the HIR bulb is - it emits roughly 75% of the light output of the HID bulbs. The installation of the HIR H4 and H7 bulb is simple, it doesn't need ballast, relay or extra parts/harness etc. and you don't have to mess around with the wiring, extra parts like HID conversion kits, it has the same base/connector just like your stock bulbs. 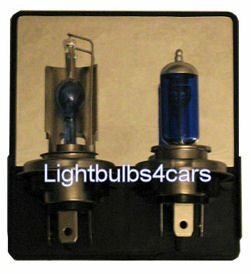 If you are looking for something between the normal halogen and the HID conversion kits, the HIR is the bulb for you, brighter than the halogen and easy to replace, without all the work like the HID conversion kit, still provide you with enough brightness and better visibility than even the high output normal halogen bulbs. ***** Because of the size of the H4 HIR bulb, it will fit most of the older model cars and trucks with the reflector type head lamp housing, it will not fit the newer models with the projector type head lamp housing. There will not be any problem with the H7 bulb type, it will fit both the relfector and the projector type head lamp assemblies. Please exam the pictures below carefully for the different in size between the normal halogen and the HIR bulbs, the HIR bulbs are slightly longer than the halogen bulbs. We recommended installing our products by a certified electrical technician or under the technician's supervision. Lightbulbs4cars.com will not be held liable for any improper use, any injure or damage of your vehicle resulted of using our products. Use at your own risk.